Why are Instagram-famous recipes so impossible to resist? Until mid-November, #TheStew was an Instagram hashtag primarily devoted to Boston hip-hop producers, filled with dimly lit shots of guys hunched over their laptops. (“Stew” is a play on “studio.”) Very quickly, though, the images featured on the hashtag transformed into shot after shot of actual stew, milky and yellow, decorated with a few chickpeas and a scattering of fresh herbs. 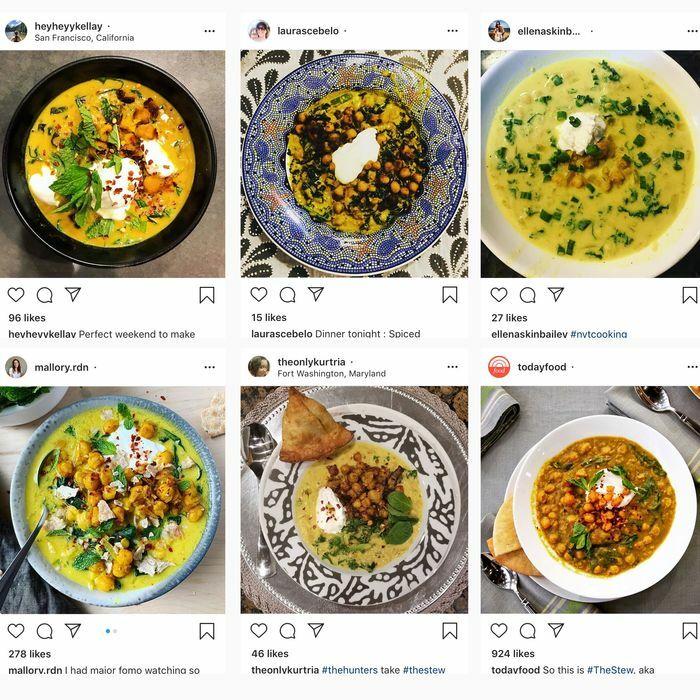 Every image was a version of the same stew, a recipe for Spiced Chickpea Stew With Coconut and Turmeric by New York Times food columnist Alison Roman, and if you follow urbane, food-loving millenials on social media, you probably thought that everyone in the world decided to make it for dinner this winter. In less than two months, #TheStew has taken on a life of its own, and has no doubt entered the regular cooking rotation for numerous home cooks around the country. In the days when cookbooks, food magazines, and product labels were the primary spots that people found new recipes, it could take months or even years for ideas to become universally beloved household staples. (It probably required at least a few Thanksgivings before green-bean casserole achieved critical mass, and people are still discovering Marcella Hazan’s superlative tomato sauce.) But in the age of digital word of mouth, you only need to see the same recipe pop up on your feed so many times before you feel compelled to try it — and then of course to post about it yourself. The Instagram snowball effect means a recipe can enter the home-cooking canon in a matter of days, not years. Call it the joy of hashtag cooking. Roman’s chickpea stew is only the latest example of this phenomenon. Others include Urvashi Pitre’s Instant Pot Butter Chicken, which got so big that it earned Pitre icon status among Instant Pot diehards; BuzzFeed’s Best Fudgy Brownies, which, unsurprisingly, were more or less engineered with virality in mind; and Sullivan Street Bakery owner Jim Lahey’s No Knead Bread, published in 2006, now considered a timeless classic among New York Times Cooking obsessives, and arguably the proto-viral recipe of the digital age. For those who don’t keep up with this sort of thing, #TheStew is actually the second recipe of Roman’s to achieve this coveted viral status. The first was #TheCookies, a.k.a. Chocolate Chunk Salted Shortbread cookies from her debut cookbook, Dining In. Between October 2017, when the book was released, and early 2018, you couldn’t go out your front door, virtually speaking, without seeing some mention of this recipe. That the recipes are relatively easy and generally delicious is part of the appeal, of course, but the most important aspect of hashtag cooking is that it allows home cooks to feel like they’re part of a community — one where joining is as easy as cooking something quick. Ava Friedmann, a Facebook employee living in New York, isn’t at all surprised that another Roman recipe went viral. She and her family, most of whom live in Chicago, are longtime fans and actually spent the night of the Golden Globes discussing #TheStew in a group text. People tend to see virality as a negative, an online version lemming-ism, but as Friedmann points out, it’s just a way of connecting. “It’s about being part of the Zeitgeist, the same way that you want to watch that show on TV that’s popular because you want to be a part of the conversation with your friends or family and at work,” she says. And it’s not that #TheStew is the be-all and end-all of stews; it’s just that it’s the stew of the moment. “This is the stew I need to make right now in order to know what everyone is talking about and be part of the online and offline community and the conversation surrounding it,” Friedmann adds.